After a suprise 20-25knot southerly last week I've been woken out of denial about the existance of wind and I'm starting to dust off the plans for a new season board. ii) 2 layer wood and foam composite baord using the pickfork upper deck design I posted in an earlier blog. In this post I'm going to chat about the Thin Board idea and cover my ideas around the wood/foam one next time. A single layer of 6mm Gaboon marine ply wood for the 132x40 deck. The deck is cut into 4 x 100 mm wide strips. The long edges of each strip are then wrapped in 50mm wide 7 oz plain weave carbon fibre tape (2.5cm of material top and bottom). Each strip then has the middle 70% fully wrapped in 6 oz e-glass with the long sides overlapping on middle of the underside of each strip. this way the underside of each strip at this stage has 2 layers; either carbon/e-glass or eglass/eglass. All 4 pieces are then glued together with epoxy and covered top and bottom with 6 oz eglass again + EXTRA PIECE UNDER EACH FOOT PAD given the failure of the last board under the middle of my heal. 35 mm rocker with most of the of curvature through the mid-section and relatively straight from the footstrap to the tip, 5mm concave reducing linearly with the last 100mm or so having no concave. Final board without any top or bottom sheet should be about 7-8mm thick along the full length. 10mm ABS rails. The estimated weight of the boar without accessories is going to 2.7kg, substantially heavier (up to 1 kg) than the Klegecell core boards I've built so far. Brokites use this style of construction but use different materials. 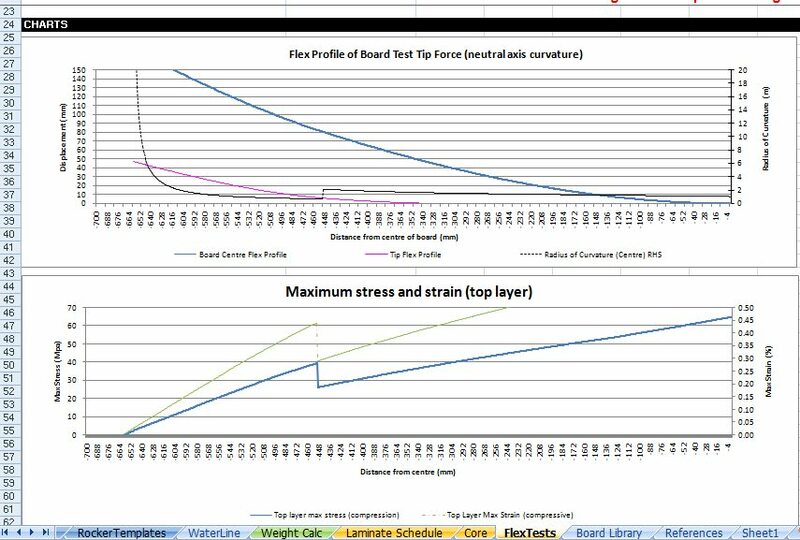 They use 6mm foam cores, which have elastic modulus of basically zero compared to marine plywood which depending on who you believe ranges from 6-9 GPa - comparable to the modulus of the carbon/glass skin I'm thinking of using which, based on BoardOff calcs, is around 17GPa. They also use heavier carbon (11 oz) for both the stringers and the first full wrap, plus s-glass for the top and bottom layers (about 30% stronger than e-glass). Its largely an issue of cost that I am trying the alternative materials with the hope that using the wood core will adequately compensate for the reduced use of carbon. 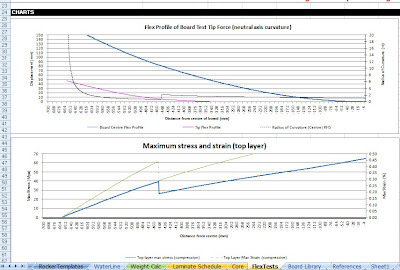 I've done some modelling of the flex and stresses using BoardOff v1.3.9 (the carbon+eglass and the 3 layer e-glass layups are saved as templates in the laminate schedule tab) and All Else Being Equal ( AEBE analysis:) this wood board is much stiffer (around 25%) than my first baord which was 2x6mm layers of PVC foam with 3x6oz layers of eglass top and bottom. 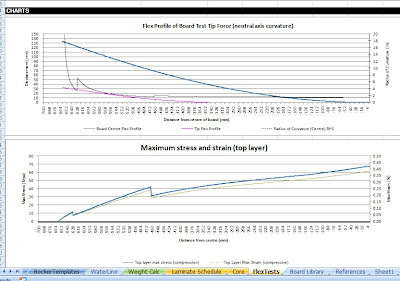 The screen captures below show a comparison of the flex profile for the different boards under a load of 40kg at the tip which is the AEBE benchmark I'm using at the moment. 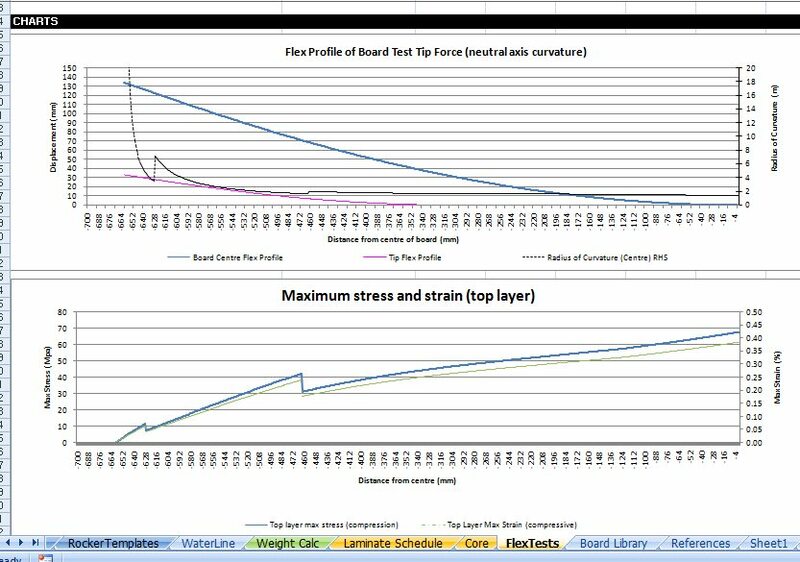 From these charts it seems that the mid-section of the old board (12mm thick) is stiffer than the new board but the new board is stiffer in the tips. I'm going to keep the board outline simple. Here are the links to the plans for the outline and for the rocker and concave for a 900mm wide rocker table. Wood - I've found a supplier for Paulownia Wood in Melbourne called Paulownia Paradise who sell kiteboard blanks and 6mm 'wafers' . However, I have a feeling that the transport cost will make this too expensive. I'm still waiting to hear back from them. So, I've found a local supplier of marine ply that has all Gaboon maine plywood. This type of plywood is about 25% lighter than other grades such a hoop pine and hardwoods but it is still much heavier than Paulownia. Gaboon plywood comes in at about 500-600 kg/m3 compared to 250-300 kg/m3. However, along with the greater weight comes greater strength although the strength to weight ratio for Paulownia does see better. I have a feeling marine ply it is. With the stiffer core material I may also need to redo the rocker table because I don't think the current 5mm ply and perspex will be strong enough to bend the ply board into shape. I may need to build up the rocker surface with a couple of layers of MFD and then the perspex. You are way ahead of me:) Still didn't finish my vacuum pump, hopefully this weekend. So I can finally experiment with a fiberglass. Good luck with this board!